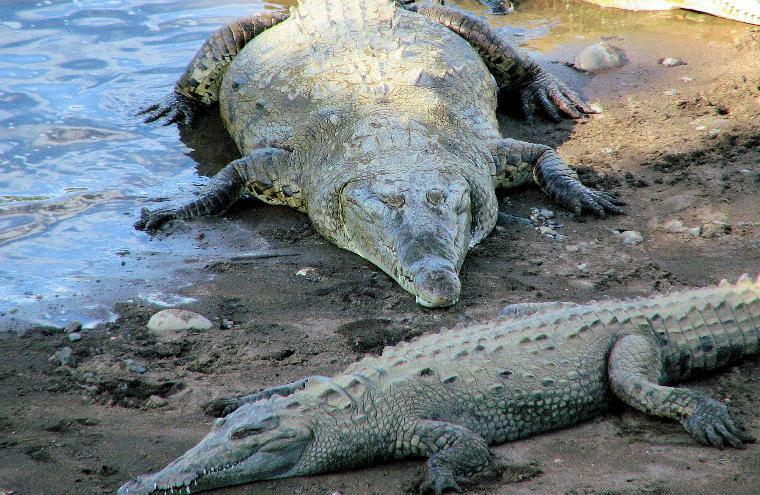 Police and park rangers of the Ministry of Environment and Energy (Minae) are still searching for 9 crocodiles, some up to metres (16 feet) long, who escaped from an artificial lagoon of the Tabacon tourist centre in Veracruz de Los Chiles. According to Major Rafael Araya, head of the local police unit, five of the 14 reptile have been captured. Araya said the smallest is 3.5 metres. The reptiles were contained by the lagoon’s wire mesh and a concrete wall, but, apparently they animals were able to create hole through which they escaped. Officials believe they will find the remaining crocodiles in nearby lakes. The area surrounding the tourist centre is mountainous. American Crocodiles can be seen throughout the lowlands of Costa Rica, gliding along rivers or sunning on muddy banks. American crocodiles are dangerous to humans; attacks in Mexico, Costa Rica, and Panama are not unprecedented. These attacks rarely make international news, so this species is not as well-documented as a man-eater, as are its relatives.The species is often reportedly timid, and seemingly lacks the propensity to attack people as regularly as Old World crocodiles do. However, it is more likely than the American alligator to be aggressive towards humans. In May 2007, two instances occurred within one week of children being attacked and killed by this species—one in Mexico just south of Puerto Vallarta and one in Costa Rica.